While we talk about things like Gossip, and Drama all the time, and mo sore in High School environments, this campaign is designed to look like people talking, and things of this sort. But theres a problem with what is going on here, which has never happened to anyone on the planet except people like Donald Trump who make Billions or are the President. In Donald Trumps case, BOTH!. Normally, people talk. And a lot of times they don't like people, and maybe a lie is told. But in my case, when lies are told, it is magically disseminated worldwide. But not only that, each and every person what comes in my life, endlessly cries wolf, telling lies and lie, and with all sorts of criminal accusations, and it goes worldwide. And normally when lies are told, the first people to confront you are your friends, telling you that something has been said. Something is on line. Something is on the news. Siding with you or asking you about them. Non of this has ever happened from my so called friends, because my friends were sent after me from a young age to remove me from society with the Police, Government, and My family. So what is this? Well it's Lies disguised as a weapon to create so much chaos, terror and torture against one man, he either kills himself, or they can try to push him out of control to arrest them, lock them away no matter what it takes. Well why would someone do something like that? Because if someone commits a crime. You just arrest them. So the answers Obvious. It is done, because someone doesn't like someone! Someone like my own Brother who's basically told me the he and his friends were going to remove me from society when I was 16. Although this really starts from the age 5 - 9 years old. I've heard of people not liking someone, but I've never heard of mass witch hunts, with all day and night 24/7 psychological torture operations to off someone, and then say peoples actions of obsessively taking the time out of their day and nights to continually torture someone lashing out in never ending rage at them with a worldwide conspiracy, then telling them, this is how the world works, is someone OK. Normally if people don't like, or mesh with someone, they just don't want to be around them. Not follow them from place to place with mass groups until they have endless nervous breakdowns and die, or their brain gives out and they die. Showing Pre Meditation, Motive, Execution of something thought out that something wants to do to someone in a mass conspiracy. And then telling them that they are imagining it, and no one knows them. While this is just a taste of information put on line around 2013, these operations have been going on all day and night for over 38 years. But the same tactics apply. People obsessively Hunting me my entire life, and when you walk away from them, they keep following you from place to place either trying to get dirt, or fabricating fiction and giving it to the masses around me. So each person that comes in my life is in an angry rage based on fantasy, and wants me dead and gone or in a cage. Of course it isn't based on anything truthful, or I would just be arrested for it. They try to carefully craft things like, "He did something, and is on the run", or "He got away with a crime" but this is all based on thin air. Example, If I am called a murderer. Their is no body or murder. Most people when told someone killed someone. Actually take the time to ask about the specifics of the situation. Example "What happened? ","Is their a body?" in my case, people actually pretend that they are stupider then a 10 years old, avoid such questions, and go for the jugular showing Ulterior motive, and Hidden Agendas. You can see from these posts which are almost all fabricated, people from my past connected to the current events who keep feeding the lies, and working with the Police who damn well know non of it is true. But their is a whole other layer of things going on. While these people are trying to collect information to give to the world, they also have mass groups stalking me all day and night in their angry rage which they Intentionally leave out. So, it doesn't matter that every time I go out for a walk, 10 - 500 people in the community come out per day with covert mental illness and terror/torture tactics. The only thing that matters is I might react? With Mike Huntley, with my family telling me freaky things that. "People are not allowed to defend themselves" for me, even stating "What you have been told isn't true" is the crime of all crimes. Showing that the Government, with my family, and the Police, have taken away my Constitutional right since a young child. So, this is not just an upset community. It is a fragment of a global 38 operation to remove me from society disguised, as this person is a nuisance, working with such Police Officers as Sean Dinse, Jensen, Toro(Fake Name), Detective Angela Stewart, who see no problem in things like attempted murder or extermination when it comes to Kevin Perelman because as they say, "He is different" or "Weird"
Last I checked, weather that is true or not, it is not a crime or threat to anyone, and most people see Different or Weird on a daily basis. These are the Met, Criminal Defamation, Defamation, Slander Google Forum blogs which surround my complex. This is all trumped up lies and the one thing you need to notice here is that their are 3 Pit bull stalkers here who are the ring leaders. Mike Huntley, Paul Humphrey, Patti Googin. All people I knew since as young as 13 years old. And all people sent after me. Notice Mike Huntley’s demeanor in these blogs with constant righteous accusations about how I am dangerous and doing all these things that don’t exist, and people need to call the police. Atone point this person even made up lies that I tried to choke him when I started to find things out. This is a man, who I knew for 25 years, originally my brothers friend, while my brother threatened my life after stopping him from bashing Greg Waugh’s head in with a crow bar because his girlfriend Jen Yang cheating on him, then telling me he and his friends were going to put me in mental institution after I didn't agree to his mobster blood is thicker then water speech, as well as him telling me to spy on Greg Waugh which I don't him, I am more interested in focusing on me and living my own life. Mike Huntley calling me up while I was in University of Colorado telling me when I graduate I should move back and start a company with him. And I did for 6 years, and at the end, he went from, being a so called life long friend to all sorts of death threats. How he was using the system against me. How he'd given me enough rope to hang myself with, saying I had better live a careful life for finding out what was going on to thug me quiet or kill me. Here this person is, still pursuing me after we split up in about 2001 with still working on me with this Criminal Defamation and slander as this blog is posted in 2013, and I am getting more knowledgeable of what was done. But you will also notice that all these people are helping with the LAPD fabricating endless lies and cover up operations with the Government and Billions invested on me. I am on a cul de sac sitting for days. I supposedly was using the Met Gym on their property. And most importantly, their cover ups when this blog starts when Security Guard, who worked the same job as Paul Humphrey, Johnpaul Naranjo, attacked me with about 7 punches to the head. And the first one from behind. And you will notice, they were so desperate, they even took my own photo inside my house of the bruises, and put it on their blog saying I attacked him and am a violent paranoid schizo. Yet the pictures are from my own camera, in my own house and not pictures they took of my attacking him, showing their true motives. Which the LAPD told him to do because they didn’t want me relaxing and going to Starbucks on Topanga/Ventura, and being social and getting work done. Not only defaming my name with these falsified accusations, but notifying all coffeeshops and people worldwide. As well as the other Starbucks locations worldwide. But also trying to blackmail me into these falsefied confessions while tryingt to force me to sign coerced false confessions to use against me. They also didn't want me to see or have a copy of what I was signing, showing their true colors. How many coffee shops have you heard of that make you sign their accusations on paper?. 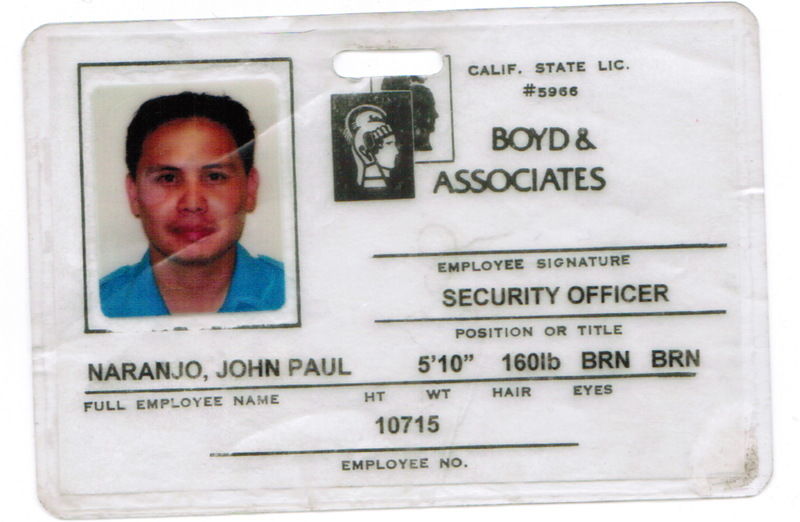 Two years later This security guard, John Paul Naranjo was involved in Assault and Battering me with something like 7 blows to the head, first one from behind. 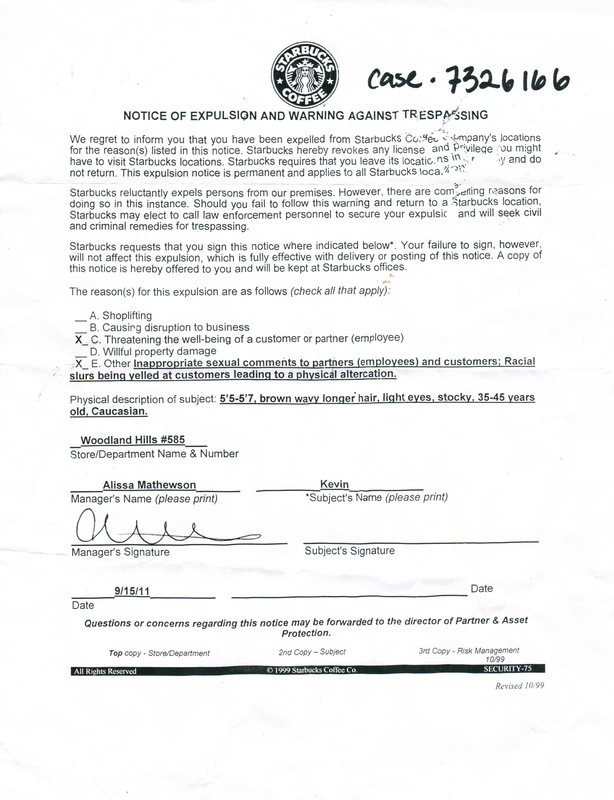 Which doesn't even work for Strbucks, but is a property security guard who was just involved in these thuggings which link to Paul Humphrey a person sent after me around 14 years old with Mike Huntley. 2 years later, after getting pictures of this paperwork is when John Paul Attacked me with 7 blows to the head, first one from behind. The next day, Greg Koenig in 21620 Burbank #2, Woodland Hills, Where I live Slashed the convertable top and tires of my Jaguar to try to thug me quiet for having this paperwork who is working with Officer Sean Dinse, and Mike Huntley in these Operations.